If you cannot solve DVD Shrink won't start problem/error, just try this DVDShrink alternative! For some reason, DVD Shrink won't start on my new Windows 10 operating system. I did an uninstall (twice) and a reinstall (twice). And when I double click on the icon, nothing happens except showing up as a process in task manager. I'd appreciate any clues in solving this problem ... or any other DVD ripping burning software that does the same shrinkage procedure if the problem can't be solved. So many DVD Shrink users have been looking around for a safe DVDShrink alternative to solve DVDShrink won't start problem/error. So what is DVD Shrink? How could there be a "won't work problem" of DVDShrink and how to solve DVD Shrink won't open error on Windows 10? This tutorial here is to help you be clear on all that listed above. DVDShrink (DVD Shrink) is a well-known DVD transcoder program for Microsoft Windows users to free rip DVD and backup DVD movies, updating to its final version 3.2.0.15 on July 25, 2004. This freeware is designed to shrink source DVD onto recordable media with minimal loss of quality, during which copy protection or region code can be removed for you. First, you may encounter several types of DVD Shrink won't start problems, such as DVDShrink can't remove copy protections, DVD Shrink can't copy any Disney movies, DVD Shrink won't work on Windows 8, DVD Shrink can't open ISO files or VIDEO_TS folders and the like. And all that leads to your failing to copy DVD with DVDShrink. So what's the reason and any clues to solve these DVD Shrink won't start problems on PC? What if you want to rip DVD on Mac? * For its ending of upgrade and lack of up-to-date decoding technology, DVD Shrink can't remove new copy protections that have come along, especially for Disney encrypted movies. * Since this DVD shrinking software stopped developing, it cannot support the new Windows operating systems, while still running well on Windows XP/2000. That's why DVDShrink can't start or work well on Window 7 or windows 10. Besides, DVD Shrink needs to work with Nero (only old version, Nero 7 or lower), because it has no built-in DVD burning engine. It seems more complicated to use DVDShrink to rip and backup your DVD. * As mentioned before, DVDShrink won't start on Mac for it is designed for Windows only. 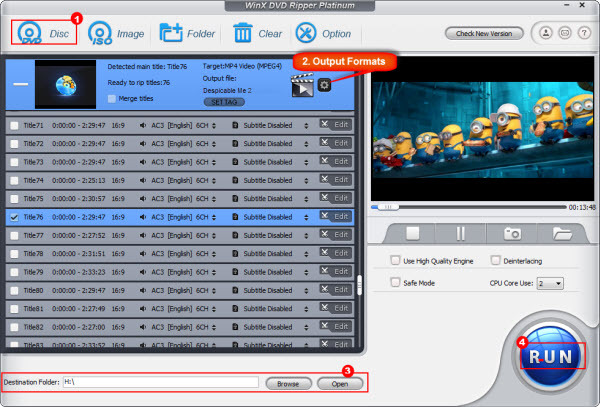 If you want to rip your DVD movies on Mac, find a DVD Shrink Mac alternative. Since there is and there will be no update to DVD Shrink, DVDShrink won't start problem cannot be solved from within. But don't worry. Actually, there are some matchable DVD Shrink alternatives which can handle your DVD ripping burning requirements even better. 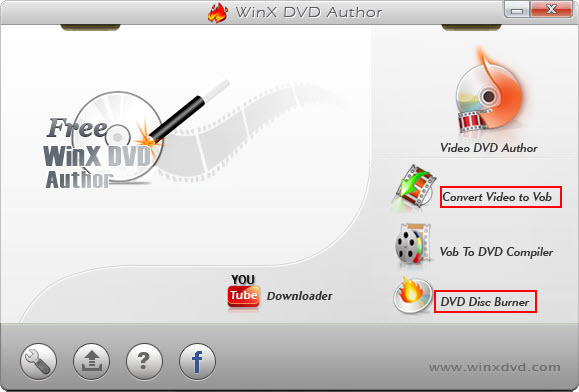 WinX DVD Author is a free all-in-one DVDShrink alternative to solve your DVD Shrink won't start problem, which helps you to convert, author and burn all video files MKV, M2TS, M4V, MP4, FLV, MPEG, MOV, RM, RMVB, H.264, AVI from camcorder, webcam, Youtube, etc to VOB file, DVD Folder and DVD disc. With this free DVD creator, you can create DVD chapter menu and subtitle as well as add background image and music easily, then burn your desired video to DVD with fast speed and high audio video quality. WinX DVD Ripper Platinum, the best DVD Shrink alternative for won't open problem, fully supports all Windows OS, including Windows XP/Vista/Windows 7/Windows 8.1/Windows 10 (32 & 64 bit). With unique technology, this DVD ripper can rip any new protected DVDs with DVD encryptions like DVD CSS, region code, RCE, Sony ArccOS, UOPs, Disney X-project DRM. It supports DVD disc, DVD folder, ISO image file as input formats and there is absolutely no "won't open problem" for this DVDShrink alternative. The best part of this DVD ripping software is that it can rip your DVD fast and exactly to any formats or devices you want with support of multiple-CPU and various presets. Besides, editing features enable you to personalize your DVD by merging or cropping videos. 1. Download the DVD Shrink Alternative on Windows or Mac. 2. Import original DVD disc, file or folder after install and launch it. 3. Select the destination folder. 4. Choose an output format. 5. Click button "RUN" to rip your DVD to computer hard drive. * WinX DVD Ripper Platinum will automatically select the right title for you if you are ripping a protected Disney movie with 99 titles. But before you use this DVD Shrink alternative to rip or burn DVD movies, please refer to the the DVD copyright laws in your countries. And we do not endorse commercial use of DVD backup software.